A couple Ukrainian Easter Eggs I made a while back. The left one is a 4 season design with spring showing. The one on the right is a tree of life design. I love this craft too. I hope everyone is having a wonderful day. Happy Easter! This entry was posted on Sunday, April 12th, 2009 at 3:00 am and is filed under Craft. 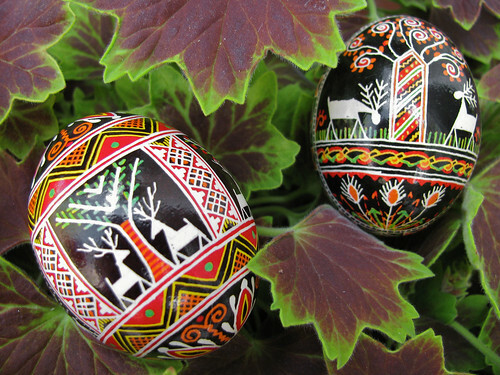 Tagged: Craft, Garden, Pysanky. You can feed this entry. You can leave a response, or trackback from your own site.